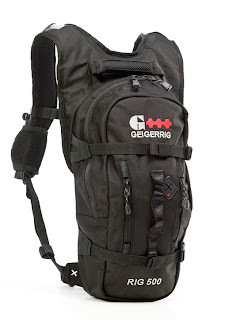 At the Fence: Geigerrig Rig 500 Hydration Pack! Did anyone guess what the giveaway would be? I am sure whoever wins this will be totally pleased! My husband LOVES his and is so looking forward to using this throughout the summer. And I am excited because he will remain hydrated! 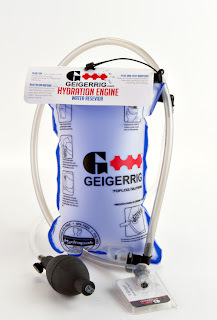 Now, I am going to give you a link back to the original post so you can do more reading up on the Geigerrig Rig 500 Hydration Pack. I will still be including quite a bit of information here. Once we had determined that there was broad, significant, predictable dissatisfaction with the traditional hydration pack, we went about developing one that addressed all of those issues. Now, it is appropriate to note that not all people were “dissatisfied” with their traditional hydration system. About 60% said that they were generally dissatisfied, and the other 50% expressed general satisfaction. However, those that expressed general satisfaction, when specifically asked questions about the performance of their pack, expressed dissatisfaction once specific questions were asked about function, cleanability, field maintenance, water access, etc. It was similar to someone who expressed general satisfaction with their old flip phone until they were asked specific questions about its use, potential use, and offered a smart phone. Suddenly all kinds of dissatisfaction points arose, and a smart phone was the next purchase. Ultimately, almost everyone, when asked questions and given a moment to consider, found that they were dissatisfied with the traditional hydration pack. A majority expressed dissatisfaction right away. The GEIGERRIG hydration pack was designed to address all of the points of dissatisfaction. For cleanability and maintenance, the system was designed to be turned inside out for cleaning and drying, and the drink tubes were designed to reconnect to the air chamber or pressure bulb where the air could be forced through the tube for drying. Also, the pressurized flow of the system prevents mouth bacteria from back washing and hosting in the drink tube and bite valve. As well, the pressurized flow of the system enabled the system to be filled with soapy water which could be flushed and rinsed through the drink tube. Utlimately, the hydration system can be turned inside out and placed in the top shelf of the dishwasher for cleaning or rinsed out and reversed for easy drying and cleaning in camp. For water use, the system was designed using a patented pressurized system that sprays the water out when the bite valve is pinched or bitten. This enables the water to be easily ingested during aerobic activity as well as easily and conveniently accessed for spraying off body and gear. It is like having a portable hose with you. No longer a product for just the soloist hiker or biker – The spray action of the GEIGERRIG system more closely matches the group, family, and social dynamic of outdoor recreation, team sports, and more. 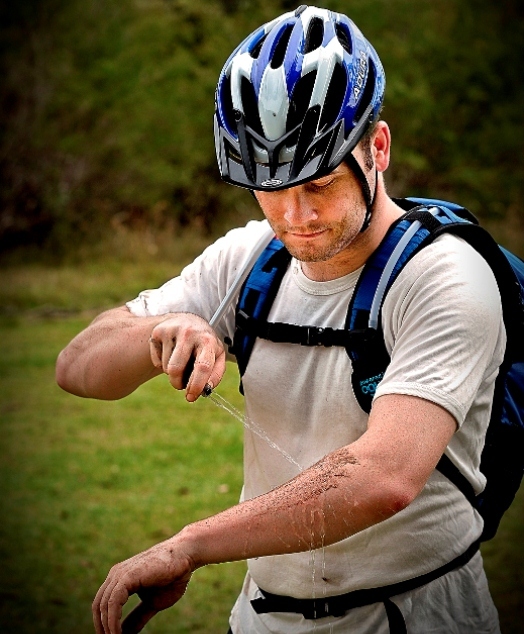 The spray action allows the contents of the hydration pack to be shared. Convenient access to ever more water is extremely important as water use and access is THE REASON for carrying a hydration pack. The GEIGERRIG hydration pack, with its pressurized system, enables a plug-and-play filter to be attached directly to the hydration bladder, in-line, with the drink tube. Thus, the system can be refilled with water from a river, stream, lake or pond; pressurized; and then off you go for filtered water on-the-go. The pressurized system pushes the stream water right through filter as it travels through the drink tube to the user. A few more awards Geigerrig has received! I personally like the fact that the Rig 500 Hydration Pack is so easy to use. You slide the bladder out, fill it with water, fold the top over and slide the sealing piece back on. After attaching your tubes to the bladder with the quick release valves. (Seriously easy to use!) Then slide it into your pack where it belongs, making sure everything is attached properly, and you are ready to go. Throw whatever else you are bringing with you into the extra space and pockets in your Rig 500 Pack, like energy bars, and head out on the trail or wherever you may be going with your Geigerrig Hydration Pack, knowing you are well, prepared. And if you throw in the Geigerrig Filter you can refill your hydration pack bladder just about anywhere and rest comfortably knowing that you are safe drinking the water. The Geigerrig 500 Hydration Pack holds 70 oz. of fluid. This is perfect for what my husband does, but should you need more it is easy to refill, and if you use the Geigerrig Filter you can fill it wherever you are. The pack is light weight and the straps are definitely comfortable. The Rig 500 is also equipped with the chest strap and a waist strap. You can completely remove the waist strap if you prefer. Remember it is easy to clean too! 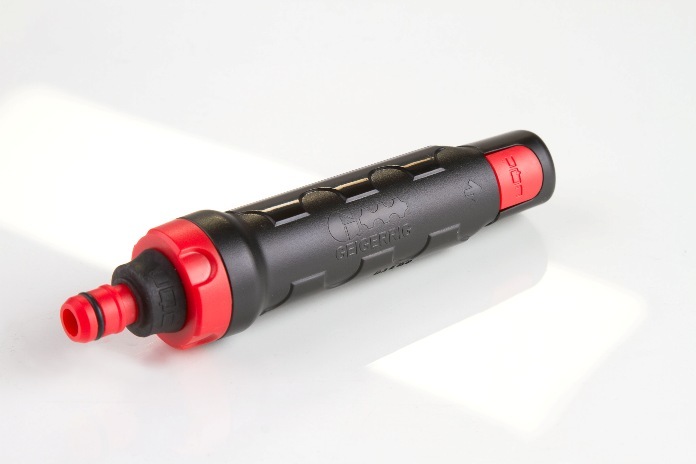 Another standout feature of the Geigerrig Hydration Pack is that with the OGWA Power Bulb you pressurize your bladder so that you can drink without sucking. Just place the bite valve in your mouth, apply a little pressure and water fills your mouth. You can use the bulb to set the pressure you desire. The other benefit is that now you can use the tube to spray with. Feeling a little hot and sweaty? Use your Hydration Pack to hose off. Have something sticky on your hands? Use the spray to clean up. Need to give the dog some water? Fill a dish without touching it with the spray feature. There are many uses for the spray feature! Be sure to follow GEGERRIG on Twitter and "Like" them on Facebook! 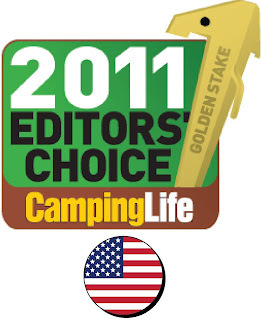 GEIGERRIG recognizes that price is important, especially in these current economic conditions. Accordingly, GEIGERRIG has designed the system to compete head-to-head on price with the comparable models from Camelbak and Osprey. Also, the GEIGERRIG hydration pack has, hands down, THE BEST VALUE ADD PROGRAM IN THE OUTDOOR INDUSTRY. You can learn about it at www.FreeHydrationPacks.com. Ever GEIGERRIG pack comes with thousands of dollars in free outdoor activities passes, ski passes, mountain bike passes, oil changes at Jeep and Subaru dealerships, etc. These offerings pay for the pack multiple times over. Now are my neighbors ready for a giveaway? Hurry up and enter and be sure to share this giveaway with others. Don't be selfish now! I want Geigerrig to see how much my neighbors would love to own their Hydration Pack so I am offering some extra entries and extra points. US only! Disclosure: I received no monetary compensation for this review. I did receive the Geigerrig 500 Hydration Pack for review purposes. All thoughts and opinions are mine. Statements in red are from Geigerrig. I would be giving this to my parents who ride bikes alot. This would certainly come in handy for them! I would give it to my dad; he hikes. 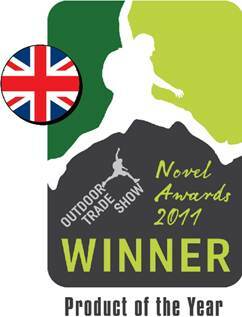 We do a lot of outdoor activities, and this would be wonderful for all of them! I read the first post, and I like that it has pockets for an iPod! my son, regularly bikes about 25 miles a day and in the florida heat, it can be brutal. this would be wonderful for him! thank you for hosting! One of my friends participates in Ragbraii- the bike ride across the whole state of Iowa- it happens in the summer and can be brutal. She raises money for various charities- this would be perfect for her! I would use this for when my family goes hiking, very cool! I read your first post and am glad to see either you nor he are carrying water bottles anymore :) This would be so much easier to take care of- it is right on his back! This would be an awesome gift for my stepmother who enjoys long hike with her dogs. I would give this to my dad because he bikes everywhere! I would use it for hiking. Cindy B (on rc/fb) My husband loves to ride his bike so he'd use it while biking. Thanks. I would use it for day hikes! u can share it with others without sharing saliva! I live in the desert, any outside activity is dehydrating....so I would use it daily to remain hydrated. :-) Thank you. I would use for family hikes! What a great product! I have one but its old! I'd give it to my BF for his b-day. He loves hiking & stuff. I would use this while hiking. I'd use this for day hikes with my friends! We go hiking in the state park near our house. Carrying two little boys doesn't leave a lot of hand or energy to carry bottles of water, so this would help! I'd use this for hiking in the Rocky Mountains. We love taking walks and are constantly trying to figure out ways to balance water bottles. The clips constantly break on us, and there are times you need your hands free. This would be a wonderful addition to our walks! My nightly walks and bike rides. I need a new one! To do some hiking around flaming geyser park. This would be for long hikes when we go out west. I just finished reading the original post & one of the coolest features I found is that there is a pocket for my Ipod!! I can't live without it, so that's perfect :D Thanks! This would be great for my husband when he's out working in the yard. I need one of these when I go hiking. I would use it for biking! I live in Texas so this hydration pack would be perfect! Thanks! I'm going to use it for the coming zombie apocalypse to keep hydrated while running. I would give to my Boy Scout son! It would be for my husband as a gift. i would love to use this when we go hiking! My husband has been wanting one of these to use when he goes running! My son works outdoors and I would give it to him so he can stay hydrated this summer. My husband rock climbs so he would love this! my hubby walks every morning so he would use it for that. Our family does a lot of mountain biking and hiking and this hydration would help for the long adventures. I would use it when I go hiking because I don't always have a water source. Hiking and biking would be a great use for this. I would using it for hiking in the woods! We do a lot of family walking and this would be perfect!! This would be great for when I go on bike rides. I would use this when I go on bike rides. See that my son gets this - works out regularly and is always thursty after. I'd use it for my long hikes and hunting pesky squirrels on our property. I WOULD USE THIS FOR HIKING. This would be great for hiking. My husband would use this due to hes a tractor operrator and is in the heat and sun all day long! I would use it on my bike rides. Thanks for the giveaway. I would use this while walking my dogs in the hot Florida sun. I would Loooove this! My husband and I both have road bikes and like to take nice, long rides. Right now--we don't have a sophisticated way to stay cool and hydrated. I would use this all the time! I would use it on my long runs. My DH would use this when we are hiking and camping. I'd use this for hiking! We've been doing trails multiple times a week and I'm sick of lugging bottles! I'd use this for hiking. I would use this for long bike rides, and walks with my puppy! I'd use this for hiking and walking! Thanks for the giveaway...we will be hiking the Grand Canyon this coming Fall; would love to have a Geigerrig Rig 500 Hydration Pack to take along ! I would use it to go hiking with my son's Boy Scout troop. I would use this pack for hiking. I would use this when I take long hikes with my kids. I read the review on GeiggerRig by openairlife and it mentioned something interesting about the plug-and-play in-line filter.That makes it easier to re-fill from anywhere there is a water supply. I like the idea that all GeigerRig packs come with 1,000s of dollars worth of free passes & merchandise. read the original post and learned that you waited for good weather so you could show the hydration pack "in action." I would love to use this for hiking! This would be wonderful for my fiance while he is doing yard work or out wade fishing in the bay. I live in Florida and love to go on bike rides. This would be perfect. I would use this at our family farm. My son would probably use it more, though, because he does the outside work, fencing, mowing, gardening, etc. He also takes long bike rides. So, this would be great for both of us. When I take the dogs for long walks. OOOH I like the ipod pockets. I would use this while walking. I have a schedule of walking from one to two hours at least three days a week. This would free up my hands from carrying a water bottle or two.